Failing to look at climate change as a scientific problem rather than a political one could lead to real impacts on our world, and it’s far past time for clearing up the issue. 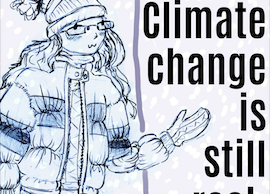 First, global warming and climate change are two different things. Global warming is the gradual increase of the earth’s atmosphere’s overall temperature and climate change is the change is regional or global climate patterns. Knowing this, when our leaders such as Donald Trump tweet, “It’s really cold outside, they are calling it a major freeze, weeks ahead of normal. Man, we could use a big fat dose of global warming!,” he is misrepresenting the facts and science of both climate change and global warming. By making comments like this, he is changing a threat to the planet into a partisan issue. The fact is, in this country both Republicans and Democrats largely agree that climate change and global warming are man-made problems. In an article by Joan Conrow on the Cornell Alliance for Science website, this is demonstrated by the fact that eight in 10 Americans support reduce greenhouse gas emissions, showing that no matter our political views, we can come to an agreement that things need to be changed. So while most of our leaders try to make it into a political issue, the majority of Americans agree that regardless of politics, these two issues need to be acknowledged and acted upon. One of the issues is that the validity of the science supporting climate change as a threat is often challenged. For example, a common argument used by people who are concerned about climate change is that 97 percent of scientists agree with climate change to demonstrate that no matter what the other arguments may be, the science speaks for itself. And yet there are some who even challenge the “97 percent statement.” According to Alex Epstein a contributing author to Forbes magazine “‘97% Of Climate Scientists Agree’ Is 100% Wrong”. He said that the people using this often referenced statistic don’t even know what the number represents. Epstein said that the meaning of the 97 percent claim is that 97 percent of climate scientists agree that there is a trend in global warming and that humans are just over 50 percent responsible for this, suggesting that the science is not as solidly behind the human contribution element of the 97 percent statistic. What Epstein failed to mention is that despite his claim that the 97 percent statistic doesn’t actually claim anything, there have been multiple studies that support the statistic. According to an article by IFLScience, seven of them at least. In these seven studies, the data suggested that the scientific agreement on human-caused global warming averaged to be 96 percent. 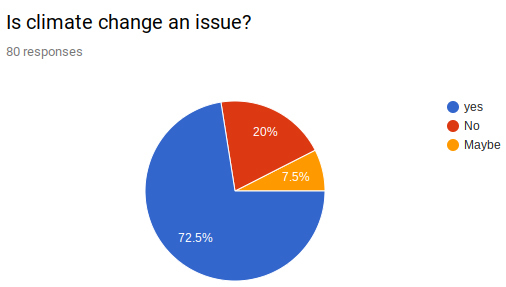 A recent Hi-Line poll shows that over 72% of the 79 students who took the survey agree that climate change is an issue not only directly affecting us in the Cedar Falls Waterloo area but also affecting areas such as Florida which just got hit by an enormous hurricane. However if you look close enough, you can see the negative effects in Iowa such as out of season tornados, abnormally large and frequent flooding and fluctuating climate patterns. Of course this is not just an Iowan issue; it is a global one as well. An increasing amount of hurricanes, flooding caused by rising sea levels and severe droughts are all wreaking havoc across the globe. So. Regardless of your political beliefs, regardless of where you live, the science backs it up and speaks for itself. Globally, as a nation and as a community, we don’t have time to argue. Climate change is an issue that we must take unified action on now.